Directions: This Oregon Knowledge test asks questions about road signs, traffic laws, and other information a driver needs to know. The Oregon Driver’s manuel includes all the information necessary to pass this test. It is a multiple-choice test with 35 questions. All tests are closed book. To receive a passing test score of 80%, you must correctly answer 28 questions. There is a mandatory waiting period after each failed testing attempt for all knowledge tests. If you fail your first, second, or third knowledge test attempt, you have to wait until at least the next day to try again. If you fail a fourth or subsequent attempt, you must wait at least 28 days before taking the test again. 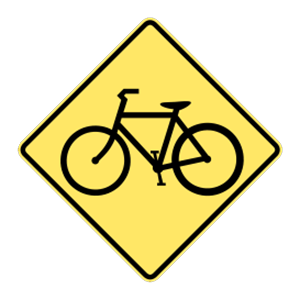 This sign provides advance warning that bicycles may be present. If a stop sign is posted. If a crossing gate is lowered. If the crossing lights are flashing. You must always stop before crossing railroad tracks if flashing red lights are activated, a crossing gate is lowered, a stop sign is posted, a flagger signals you to stop, or a train is visible or so close to the crossing that it would be hazardous to continue driving. If you are unsure if a train is too close for you to safely cross the tracks, stop. Never race a train. If your turn signals fail, you should use ____ to indicate that you are turning. If your vehicle's turn signals do not work, you should use hand signals to indicate when you intend to change direction. Passing on the left is permitted from either direction. Passing is permitted from the lane next to the broken line. Passing is permitted from the lane next to the solid line. Passing is not allowed from either direction. A broken yellow line alongside a solid yellow line means that passing is allowed from the lane on the side next to the broken line. Maintain liability insurance for as long as you drive. Take a breath, blood, or urine test if arrested for driving under the influence. Post bail or appear in court if arrested for a traffic violation. Keep your vehicle’s equipment in safe operating condition. Under the Implied Consent Law, by driving a vehicle in the state, you give your consent to take a breath, blood, or urine test when asked to do so by a police officer if you are arrested for driving under the influence of intoxicants (DUII). Refusing to take one of these tests when asked will result in potential legal repercussions. Always stop, whether there’s a stop sign or not. Watch for children and be ready to stop. Always sound your horn when you see children. 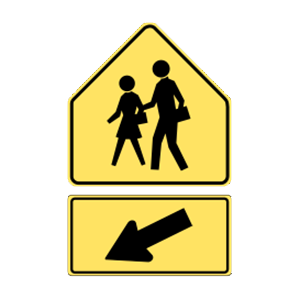 Be ready to help children crossing the street. You must always yield to pedestrians who are in or about to enter a crosswalk. Be alert to pedestrians when driving across intersections or turning. Which penalties may you face if you provide false information on a DMV application? Giving false information when applying for a driver license or identification card is punishable by a one-year suspension or cancellation. In addition, submitting a false application is a class A misdemeanor, which is punishable by fines and/or imprisonment.